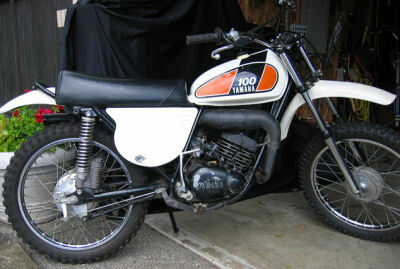 The 1975 Yamaha MX100 for sale is a very nice vintage dirt bike as you can see from the pictures. This old Yamaha dirt bike is in very good to excellent condition with all original parts. The motorcycle cranks right up and the engine runs steady and strong. It's a great vintage bike that looks really cool, has not been ragged out racing up and down the dirt track. We are the 2nd owner of the Yamaha dirt bike for sale and during the time that we have owned it it has seen limited use. The bike is located in Puyallup, Washington and the asking price is a very cheap $950. If you're interested you can request to see more pictures or make an offer by leaving your request, questions and contact information in the space below provided by GoGoCycles and we'll get back with you as soon as possible. GoGoCycles would also encourage bikers to submit a review of the 1975 Yamaha MX100 for sale to help potential buyers make informed decisions and to benefit the biker community as a whole. My dad bought me one of these back in 75. I raced motocross from 70-76 on a variety of bikes but THIS bike was wicked quick!. Sure I was only 13 but it was flat out scary. My friends were scared of it ha. I WISH to god I could afford to buy this bike. What great memories. The MX100 is a very good little woods and trail bike. It has good power for an old 100cc bike with 1st and second gear wheelies on demand and sometimes will power up in 3rd a little. It has a very high top end for a woods bike and I've passed a police radar trailer at 71mph on this bike high gear hard as she would go handles ok for a dinosaur. It's pretty lightweight so you can throw it around easy. My advice is to stay away from big jumps on this bike because it will break your back but it takes smaller jumps ok.. but definitely not recommended for big jumps. Brakes? what brakes LOL! No really, it will stop you just fine but drum brakes are well... just that.. drum brakes. I've had my 1975 yamaha MX100 for about 7 years and ran the eyeballs out of it with with zero reliability issues. It always cranks right up on second kick even in 15 degree weather. It's not the best bike in the world or the best looking or the fastest but it's dead reliable and a hoot to ride. It always does what I want it to with no complaints. It's a good reliable and relatively quick bike for what it is.